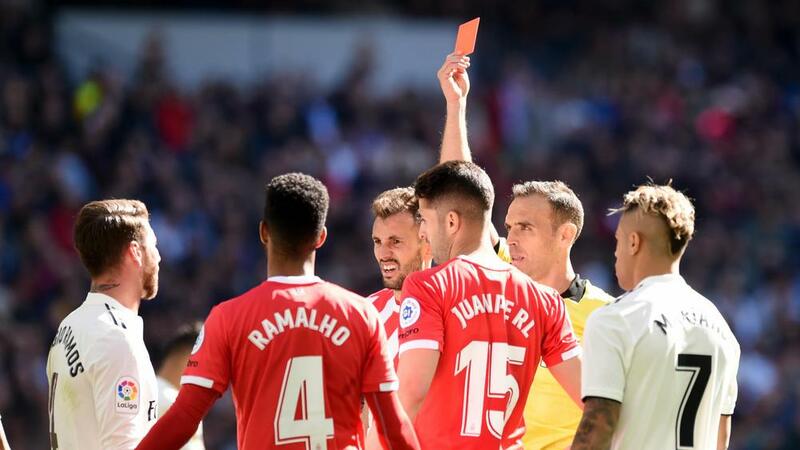 Santiago Solari described Sergio Ramos' latest red card as an "occupational hazard" after the Real Madrid captain was sent-off in their home LaLiga loss to Girona. Ramos was dismissed in the last minute of Sunday's 2-1 victory for relegation-threatened Girona at the Santiago Bernabeu. The Spain defender earlier conceded a penalty for handball, for which he was booked, and was shown a second yellow after catching a Girona defender with a high boot in the process of attempting an overhead kick. It ended a controversial week for Ramos, who backtracked on suggestions he deliberately received a booking in Madrid's 2-1 win at Ajax in the first leg of their last-16 Champions League tie so he would be available for the quarter-finals, should the holders progress. Ramos has now been sent-off 20 times in LaLiga, more than any other player in the history of the competition, but Solari would not criticise his skipper. "They are occupational hazards," Solari told a news conference when asked about Ramos being sent off. Despite Madrid having no upcoming midweek game, Solari opted to rest regulars including Vinicius Junior, Gareth Bale, Sergio Reguilon and Dani Carvajal for the visit of Girona. Luka Modric was also missing due to suspension as Madrid missed out on a sixth straight win in the league, a defeat instead leaving them nine points behind LaLiga leaders Barcelona. But Solari denied regretting his team selection as Cristhian Stuani's penalty and a Portu header turned the game around for Girona, who trailed to Casemiro's first-half header. "Those questions are impossible," the Madrid coach added. "Talking about past or future hypotheses is not a job we can do. We make decisions and compete and sometimes we do not win. "It's a shame, we dropped points, the rivals won and we moved away. We came with a good streak, cutting points and we have to continue striving. "The league is not lost, at all. We will continue fighting for the three fronts that we have open. All matches are difficult against any team, as demonstrated today. Girona have played a very serious game and we have to keep working to keep trying to win. "There is always a rival and today they did well both in the first half when we dominated and in the second, they came out with energy, they pressed very well and attacked. "Attrition is not only physical, it is mental, of concentration... there are many factors. We came from many hard matches that we have overcome and it may be that it took its toll in the second half."